President Obama got an “up close and personal” —VERY personal as it turns out— look at the pyramids before leaving Egypt today. 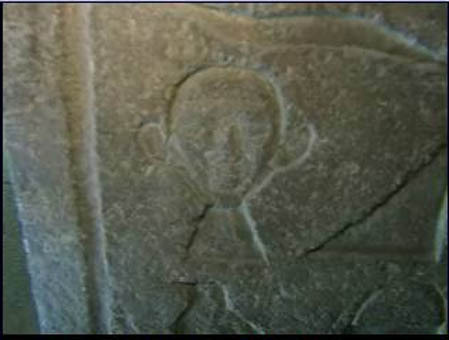 One of the tombs contains a 4,600-year-old relief portrait of a man named Kar, who was a priest, scholar and judge. He also looked exactly like Mr. Obama – big ears and all. Take a look! Now, check out the President’s reaction. Guide: This is a tomb dated four thousand 600 years ago. And the person who is back here, his name is Kar. His name is written in hyroglypic and it looks like Kar. Obama: That looks like me! Look at those ears. 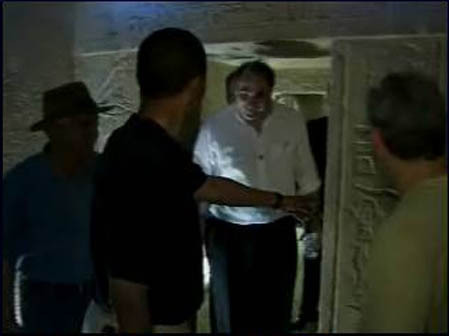 He even brought Press Secretary Robert Gibbs and Senior Counselor David Axelrod over to show them the resemblance. President Obama showing his aides the resemblance. Obama to Gibbs and Axelrod: I want to show you something. Guide: Mister President, you look like King Tut. It’s true. I said this the whole time – two years ago. You were a king in ancient Egypt. I'm not sure who's dumber – Brian Williams or Anderson Cooper. His "tour guide" was Dr. Zahi Hawass! I'm sure Dr. Hawass will be happy to know that he has been demoted from Secretary General of the Egyptian Supreme Council of Antiquities to "tour guide". WOW! Very interesting, and eerie! All I can say is that I Love That Man. He and his family are awesome. Oh man that is funny? Does this make Michelle Cleopatra? And do we call Obama Mr. President or Mr. Pharaoh now?? I love it! But did Kar have that great Duchenne smile? I cannot believe it! Thats sooo cool. I haven't laughed this hard in years! Wow....who knows maybe Obama 1 was into chariot racing, before Obama 2 took up hoops! It's good to know that our new president as a sense of humor about himself! So nice to see that he has such a great sense of humor. that is pretty funny!!! it does look like him! That's hilarious. Love the sense of humor. It does look like him though. This is so neat, yet very strange. It is hard to believe, but all of us are always told we have a twin out there somewhere. We are never told if the twin is alive or dead. Thank you so much for sharing these photos and information!! So it is written So it will be done! The man has a sense of humor. Good for him! Funny! I am glad our president has a sense of humor!